The wooden crib slats can break, creating a gap, which can pose an entrapment and strangulation hazard to infants and toddlers. This recall involves about 96,000 Jardine cribs (320,000 units were previously recalled in June 2008, and 56,450 units were recalled in January 2009). It includes 7 models of Jardine wooden cribs with the following date codes: model number 0102B00, Drop-side Natural Olympia Single with date code 9/2005-1/2007; model number 0102E00, Drop-side Dark Pine Olympia Single with date code 9/2005-1/2008; model number 0302P00, Black Olympia Lifetime with date code 11/2005-5/2008; model number 0302C00, White Olympia Lifetime with date code 6/2006-12/2006; model number 0312D00, Americana Pecan 4-in-1 with date code 5/2006-11/2007; model number 0308L00, Antique Walnut Capri 4-in-1 with date code 12/2005-11/2007; and model number 0108C00, Drop-side White Capri Single with date code 8/2006-11/2007. Cribs with other date codes are not affected by this recall. The date code and model number are printed on the label located on the inside of the bottom rail of the headboard or footboard. KidsWorld, Geoffrey Stores, Toys "R" Us, and Babies "R" Us stores nationwide, and at babiesrus.com, from September 2005 through April 2009 for between $220 and $330. 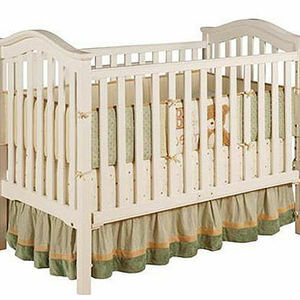 Immediately stop using the recalled cribs and contact Jardine to receive a full credit toward the purchase of a new crib. Jardine will provide consumers with detailed instructions for purchasing cribs in retail stores and online. For more information, contact Jardine at (800) 646-4106 between 8 a.m. and 4:30 p.m. ET Monday through Friday, or visit http://www.jardinecribrecall.com/.